This is an unofficial home page for the Legion of Mary. All comments expressed here are personal and may not necessarily represent the official exposition of the Legion as outlined in the handbook. Questions concerning specific procedures of the Legion system should be directed to the nearest Legion of Mary Council. Information about the Legion of Mary; what it is, what it does, how it works, who can belong, and how to start. Answers to Frequently Asked Questions (FAQ) about the Legion of Mary. Legion of Mary Photo Gallery where you can see picture of legionaries from around the world. Would you like to have your Praesidium included in our Legion of Mary Photo Gallery? Complete our ONLINE FORM to submit your Praesidium information. These prayers are recited at every Legion of Mary meeting. The Tessera prayers are also prayed daily by all Auxiliary Members. A book in PDF format (1.9 MB) which is Montfort-based and intended to favor a true and ever increasing devotion to Our Lady Mary Immaculate. This book will help one to gain a deeper insignt into the meaning and the mysteries of the Magnificat of Our Lady, especially as these relate to the Eucharistic-centered sacramental system. Subscribe to Maria Legionis Magazine! Give a gift subscription - renew your own subscription. 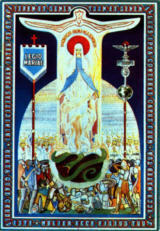 Maria Legionis is "The Magazine of the Legion of Mary". The subscription form is also available in MS Word, PDF, and RTF formats. Subscribe to Maria Legionis Magazine today! Interviews with Frank Duff. The Legion of Mary Handbook on tape plus "Can we Be Saints?" by Frank Duff. The Legion of Mary in China by Rev. Aeden McGrath; the Legion in Iceland and Russia; the Legion in Siberia; tapes on the lives of Alphie Lambe, Frank Duff, and Edel Quinn; and much, much more! A series of eleven Allocutios originally given by Fr. Lendacky. Excellent reference material for use in Legion meetings and workshops. What is the Legion system? How do we learn about it? Creativity in the System by Edel Peffley. List of Suggested Handbook Readings for a College Praesidium as prepared by Father Francis Peffley. It can be adopted for use by any Legion of Mary Praesidium. Procedures for Conducting "On the Street" Bookbarrow Apostolate as prepared by Father Francis Peffley. These procedures can be adopted for use by any Legion of Mary Praesidium. "You are a movement of lay people who propose to make faith the aspiration of your life up to the achievement of personal sanctity." Speech given by Bishop Fulton Sheen at the Annual Council Officers' Meeting in Rochester, N.Y.
Reflections for a Legionary of Mary, from Queen of all Hearts Magazine with Ecclesiastical Permission. Archbishop Desmond Connell has accepted and signed the official petition to introduce the cause for the Beatification of Frank Duff, founder of the Legion of Mary. In the 30's and 40's when Dublin Envoys went throughout the United States working to plant the Legion everywhere, they were often startled to discover that the priests they were contacting were already aware of the Legion and were waiting to be approached. The question, "Have you ever heard of the Legion of Mary?" was often answered: "Sure!--from Joe Donovan!" Article by Robert H. Nyssen reprinted from the December 1990 issue of This Rock magazine by permission from Catholic Answers, Inc. Preparing children for their mission in life is an extremely difficult task for parents, teachers, and others. This article is about raising children and how the spirituality of the Legion of Mary can help in their development. "Set your house in order." (Isaiah 38:1) This checklist can be used for three weeks to help prepare a praesidium to be in conformity with the handbook. Our strength lies in our uniformity in the Legion. All about the Miraculous Medal. This short article will tell you how it came to be, it's significance, and why it is important to always wear the Miraculous Medal. "Why would you need me in the Philippines?" I asked. "They're all Catholics!" Ignoring my objection, he said: "Father, if Asia is ever to become Christian it must be through the Filipino lay people." Article by Father Aidan McGrath. An article written by REV. MSGR. THOMAS B. FALLS, S. T. D., Ph.D., Archdiocesan Director of the Philadelphia Senatus, Legion of Mary, and Pastor Observer at the Second Vatican Council. Composed by Frank Duff, founder of the Legion of Mary, this prayer also includes Scriptural references for each line. If you love to pray the Rosary but find yourself easily distracted, discover how to replace monotonous repetition with prayerful, powerful, pleasing Rosary meditations. Learn about the two methods developed by St. Louis-Marie de Montfort and how they can enrich your daily Rosary prayers. On September 7th, 1996, the Legion of Mary turned 75 years old! Read this Allocutio Addressed to Legionaries of Mary Worldwide on Preparation for the Diamond Jubilee Celebration of the Founding of the Legion of Mary, by Reverend Father Joseph Moran, O.P., Spiritual Director, Concilium Legionis Mariae, released in September, 1995. Cardinal Suenens of Belgium is probably the most ardent supporter of the Legion among the hierarchy. This tribute to the Legion of Mary is a condensation of a talk, which Cardinal Suenens gave to 1,000 Legionaries in Liverpool, England. Twenty suggestions for the organization of a new Legion of Mary praesidium. Compiled from Legion of Mary Sources. Reference list for ordering literature, books, and religious supplies for the Legion of Mary. By Father Francis Peffley. This article explains how the Legion of Mary can assist the pastor. Three years of suggested Legion of Mary handbook readings for a seminary praesidium. An examination of conscience for a praesidium president. Useful tips for door-to-door visitation by members of the Legion of Mary. Some things to consider as members of the Legion of Mary prepare for door-to-door visitation. Trivia questions about the Legion of Mary handbook. Suggested handbook readings for the first and second year of a new Legion of Mary praesidium. The historical significance of the Legion of Mary in South America. Trivia questions about the Legion of Mary. In order to examine Mary's place in the mission of the Holy Spirit, we should first look at Mary's relationship to the Holy Spirit. Published by the Los Angeles Senatus, this article was written by William M. Thompson, Jr. Here are some of my favorite daily prayers. Here are some hot links to other good Catholic Web sites. Learn more about the one holy catholic and apostolic Church and how to share the faith with others. This site is operated by Transporter Info Services. � 2007 Transporter Info Services, All Rights Reserved.